In what may arguably be the best American novel, Herman Melville takes a break from discussing and pursuing a white whale and devotes a small chapter to sharks. The harpooners on board the Pequod had come across a teeming, frothing, fuming school of great white sharks. Queequeg had never encountered such ferocious beasts, and as they hoisted one on to the boat, he was about to have an encounter he wouldn’t soon forget. We like the God who made the rainbow, the sunrise, the butterfly. But what about the God who made the storm, the darkness, the shark? We could put this another way. We like a God of our own making, a God on our own terms. We can come to this conclusion by taking a look at the survey, The State of Theology. Here’s an excerpt from the infographic, but you can find all the results and the full story at TheStateOfTheology.com. One of the things the survey reveals is a significant confusion and disconnect when it comes to thinking about God. Seven in ten Americans believe there is one true God in three persons. That’s encouraging, maybe even pleasantly surprising. But if we drill a little deeper we see some problems. Over half of the same people surveyed think the Father is more divine than the Son, and over half think the Holy Spirit is less divine than the Father and the Son. 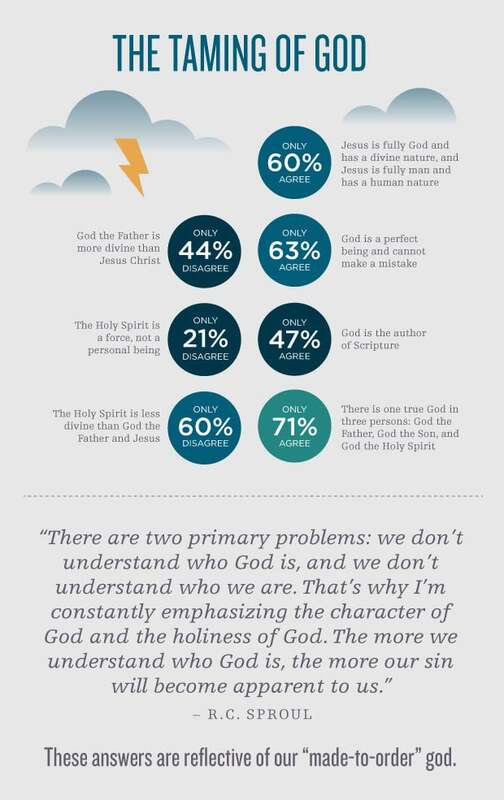 What’s more, 63% think the Holy Spirit is a force and not a person. Now we see the confusion. Admittedly the doctrine of the Trinity is difficult. This survey was not asking people to explain it, but simply to affirm what they believe or don’t believe about the doctrine of the Trinity. Perhaps we can explain the confusion by looking at long-held American beliefs. God has always played a significant role in American culture. In 1865 as Abraham Lincoln faced a divided and war-torn nation for his second inaugural address, he said, “Both [North and South] read the same Bible and pray to the same God, and each invokes his aid against the other.” In 1954 the phrase “under God” was added to the pledge of allegiance. And in 1956 the words “One Nation under God” appeared on U.S. money and became something of a national motto. Though the atheists make a significant amount of noise, we are not a nation of atheists. We are a nation of theists. And that’s encouraging. When we start looking into the theism, however, we see cause for concern. The question about belief in God has always been about one thing: What God? While theism is good, Trinitarianism is better. A consistent biblical Trinitarianism is even better still. Should we aim for anything less? Here we see a call for the church, especially the American church, to take up our task of making God known with a renewed sense of urgency. It’s not simply the confusion or wrong thinking about the Trinity, however, that we should note. We also need to consider God’s attributes, or His character. In our survey we wanted to see what Americans inside and outside the church think about the sovereignty of God. We first asked if God can make a mistake. Nearly a quarter said that He could, with another 14% not sure. Then we asked if God determines what happens in the future or if He simply knows it in advance. The results? 49% agreed, 34% disagreed, and 17% were not sure. Only one-third of those surveyed think God controls the future. Then we asked about God’s wrath. God’s attributes of love and mercy and the like seem to be well accepted. As the bumper sticker declares, God is love. But what of God’s wrath? One-third disagree that God shows His wrath, with another 13% not sure. And now we are back to Melville, Queequeg’s exclamation about God, and the shark. God is not what we would like Him to be, or what we would prefer Him to be. He is as He is and as He has revealed Himself to us in His Word. Have you read Nahum chapter 1 lately? God’s way is in the whirlwind and the storm. Indeed, “Who can stand before his indignation? Who can endure the heat of his anger?” (Nah 1:6). This is a serious God.